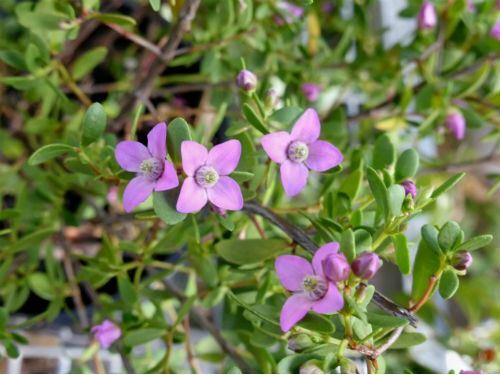 Boronia crenulata, sometimes known as the Aniseed Boronia, is a Western Australian native and is found in the southwest corner of that botanically rich state. This small shrub will reach a height of about one metre with a similar spread. The leaves are spoon-shaped, about 1.5 centimetres long with a strong aniseed aroma (hence the common name). The delicate, four-petalled flowers are pink and are present for most of the year with the heaviest blooming from late winter to spring. Some plants may sucker. When purchased the plant was labelled ‘Pink Passion’. We don’t know how this cultivar differs from the species probably by not very much. Previously boronias have not featured in our cold climate garden. We felt that perhaps they were too delicate for our exposed situation. Also we had little or no success in propagation. B. crenulata has changed our opinion on both counts. This species seems very hardy and cutting propagation has proved to be rather successful. In less than 12 months we have recently potted on the second batch of struck cuttings giving a total of 13 plants rather than one. Perhaps it is time to try other boronias both in our cold climate garden and propagating bench. Boronia crenulata was first named from collections made in the early 1800’s from material collected at King Georges Sound, Western Australia. Propagate, as above, from cuttings.